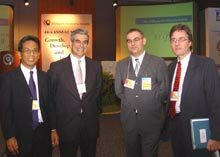 The keynote speech by Jaime Augusto Zobel de Ayala II struck an optimistic note, outlining some ideas how the present positive economic trends could be made more lasting. He focused on the role of the business sector, the need to measure itself by global standards and the need to be more creative in developing new goods and services, including some aimed specifically at the needs of the poor. He acknowledged the influence of Prof. Prahalads book “The fortune at the bottom of the pyramid” and gave examples of his own companies new approach, for example in delivering water to poor neighborhoods in cooperation with local communities. "Individuals and families in the lower economic strata need products and services just as much, if not more, than the upper economic members of society. The challenge is to find ways of serving their needs in a manner that is affordable, accessible, and viable," said Mr. Jaime Augusto Zobel de Ayala II. The first panel discussion focused on the conference theme, contrasting the performance of other Asian countries with that of the Philippines, and drawing lessons from it. Discussions centred on the “Philippine Paradox”, as the World Bank representative Joachim von Amsberg called the relatively poor performance of the country during the last decades despite its good endowment with natural resources and good educational achievements. This was blamed mainly on weak institutions and bad policies - failures of collective action, as Dean Raul Favella from the University of the Philippines called them. The afternoon was taken up by parallel sessions on various specific topics, ranging from monetary policy and investment to decentralization and education, thus looking at a broad range of relevant institutional factors. The second day looked in more detail at the regulatory and governance environment. 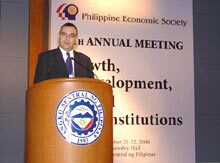 Gilberto Llanto looked at the crisis in governance by analyzing the strength of vested interests in the Filipino political structures and their ability to capture regulatory agencies, perpetuating their dominance and excluding competitors to the detriment of overall economic performance – a structural weakness noted in many discussions. Lastly, several analysts attempted a forecast for 2007. The general consensus was that the economy would probably tick along at a growth rate of around 5 %. The fiscal position of the country was lauded by many speakers, and there was broad feeling that the core economic team of the government was managing the economy in a fairly sound manner. What worried many was the negative trend in domestic investment and capital formation and the low rate of job creation. Among the domestic risks cited were a danger of fiscal profligacy in connection with the 2007 elections and a continued diversion of political attention due to the charter change debate. The conference has served to draw significant public attention to the needs for policy and institutional reform. Some key speeches have been widely reported in the media. Anyone interested in a blueprint for reforms would have found valuable inspiration. The crucial question is how to reform institutions so that they contribute to economic efficiency. The success of the Philippines in bringing the fiscal situation under control and of making the Bangko Sentral independent show that there is reason for hope. This program has been very much in keeping with one of the focus areas of the Friedrich-Naumann-Stiftung, namely to promote the insight that countries that promote economic freedom tend to be more successful in fostering economic growth, poverty reduction and human development. A lot of studies have been done on this, including an annual Index of the Economic Freedom of the World, to which the Foundation contributes. "In a time when the gains achieved by the World Trade Organization are under threat and illiberal economic policies stage something of a comeback, this message is all the more needed," said FNF Manila Resident Representative Mr. Siegfried Herzog.